Today I want to show you two scarves – sisters – that share the same design in a different colourway. 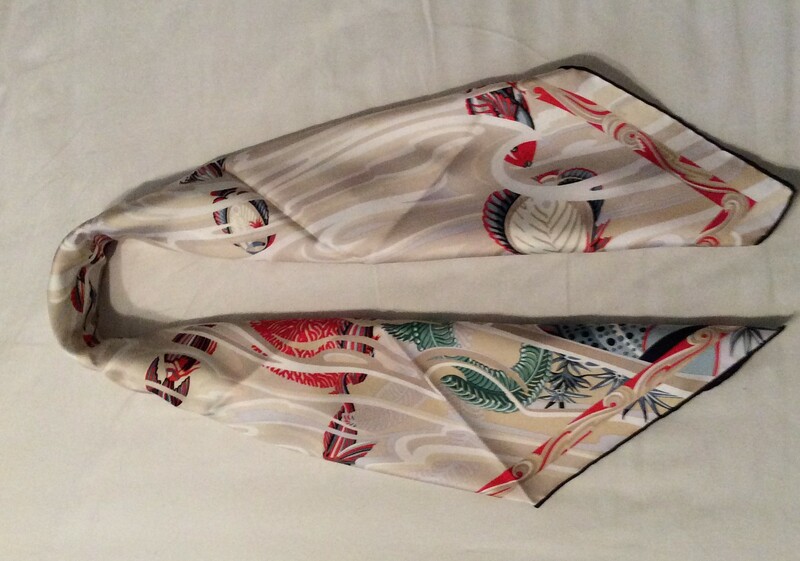 It shows very well how completely different two scarves of the same design can look, depending on the colours. 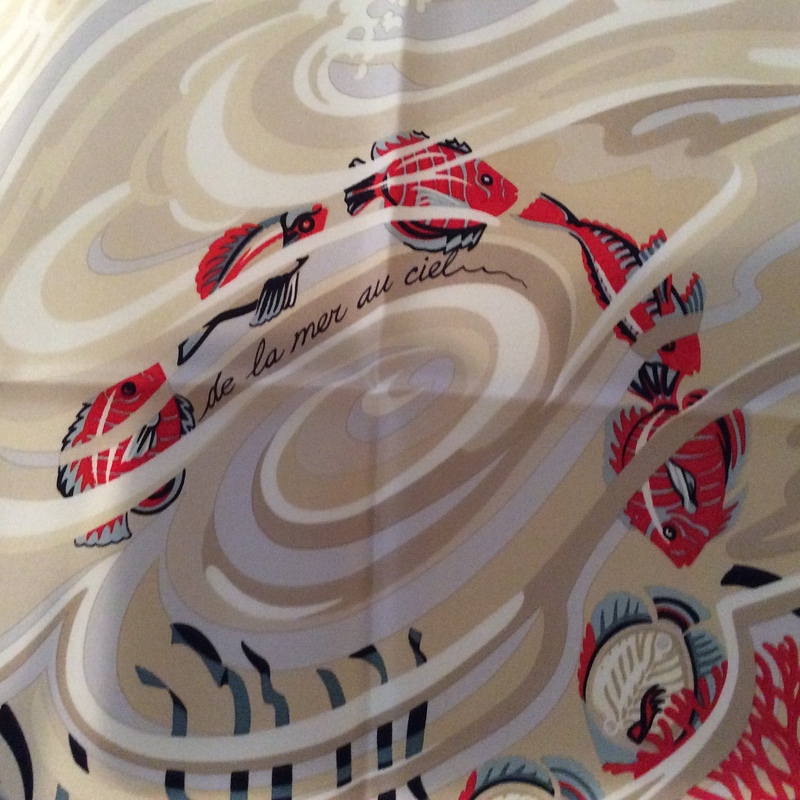 De la Mer au Ciel is a design that was launched in 2014 (the year of Metamorphosis) and it was created by Laurence Bourthoumieux (who signs her work with the nom de plume Toutsy). It is in the classic size, 90x90cm. De la Mer au Ciel depicts a scene of sea and sky, where the fish emerge from the water on one side and turn into birds, on the other side the metamorphosis runs in the other direction, birds turn into fish again and go back into the churning sea. Clouds and waves intermingle in this rather busy design, but there is a softness to it that attracts me, a curvy symmetry that is both dynamic and whimsical. The first scarf is done in neutral colours: grey, navy, black and a soft off-white give us a rather sombre image of sea and sky. The second one has a lighter athmosphere. Beige, vanilla. soft green and a bright corally red make up the scene here and promptly we get to see it in a wholly different light. 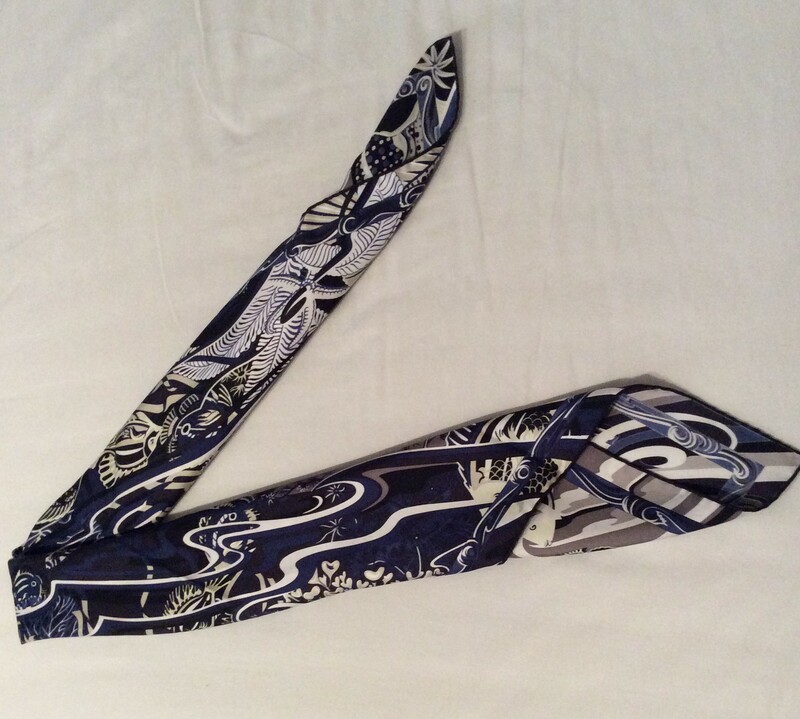 A very interesting thing about this scarf is also its versatility when tied. You can have a grey scarf or a blue one, depending on the diagonal you choose to show when folded. Same with the light colourway, I can choose which corners to show, which diagonal to fold along to get very different results. 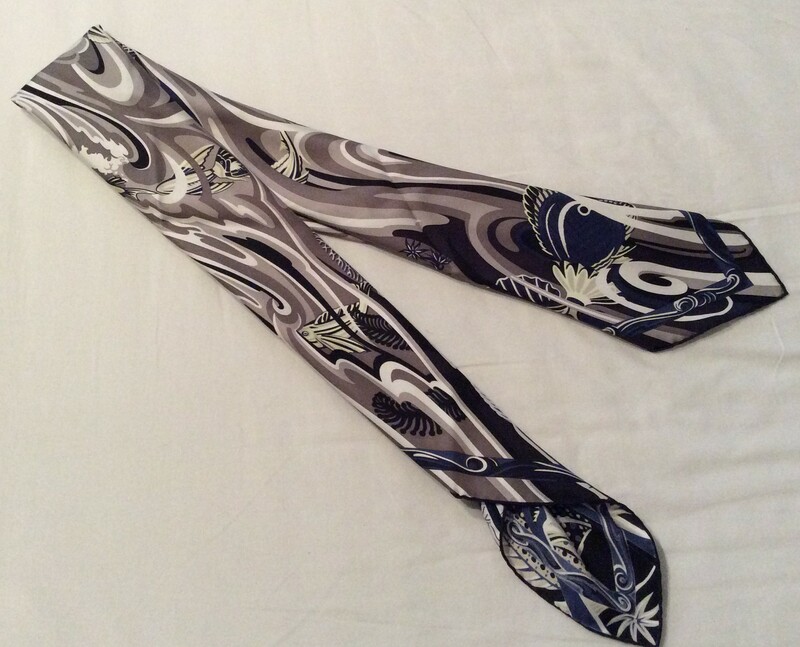 This is how they look when worn around the neck. Let’s have a look at a few details now. 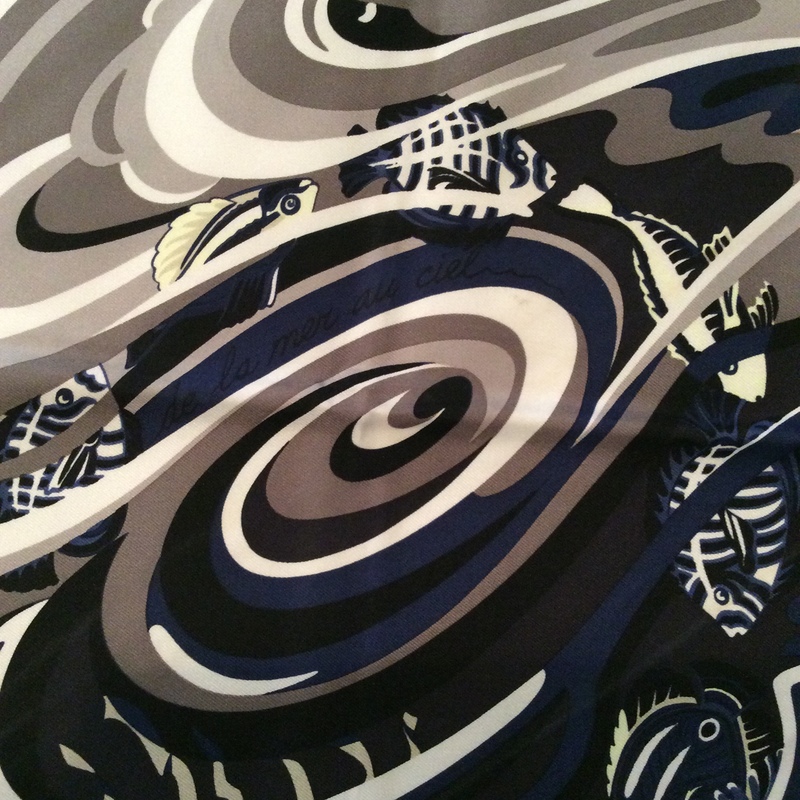 The centre shows the scarf’s name as well as the swirly centre of the churning sea. The details are clearer in the lighter colourway, while in the darker one you have to actively go looking for the fish and plants. Here we see fish swimming in a coral reef, again the lighter colours provide a clearer picture, while the darker one seems more abstract. I love this design because it is tapping into my love for the magical. The circle of fish turning into birds turning into fish seems so beautiful to me. The fish gaining the skies, even for only a short time seems hopeful and optimistic. It is not exactly how evolution worked, but that is not the point of the design anyway, it is a flight of fancy rather than a nod to Darwin. I bought the first (dark) one through h.com and found the second one after a long search on usa.h.com, which is tantalizingly inaccessible for Europeans. But that is what fumie friends are for, isn’t it? Enter Daisy, an amazing food blogger, perfume fiend and great friend who resides in New York City. She nabbed the scarf for me, had it delivered to the Madison Avenue store where I picked it up on my trip to NY last November. Surely another story of acquisition I will never forget. Do you like this design? Do you prefer one scarf over the other? Which one and why? 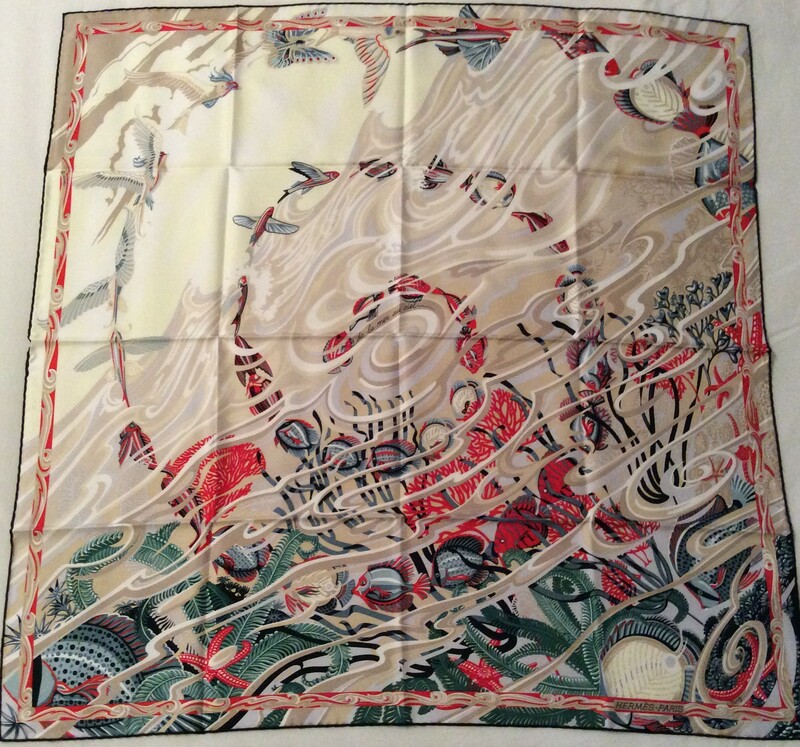 This entry was posted in Hermès, Scarf Collection, Scarves and tagged Hermes, scarf collection, scarves. Bookmark the permalink. Love the design. In both colourways, actually. For myself I would chose the black one for its mysterious elegance and the way the design almost looks like an abstract painting. The dark one does look a lot more abstract, so interesting, isn’t it? I love the colours on the second scarf and would wear this one when I am in a much better mood and feel cheerful and in the mood for fun (hopefully!) Very clever designs and one could spend hours looking at them. Unfolded I prefer the vanilla one, but folded, I think I like the blue one. The detail in the blue one confuses me a bit when opened out, but folded, the blue one is active and dynamic. The vanilla, when folded, loses a but of its character. They are both lovely though. Same here, Annemarie, I prefer the dark one when folded, but love to look at the light one (might be a wall candidate). I love both color ways and the design may be my favorite of the beautiful scarves that you have featured. The darker one is the most appealing to me as it seems the most versatile and I would enjoy poring over the details but of course the vanilla/coral is stunning as well. As always, thanks for sharing your collection! You are very welcome, I’m really glad you like this one, ringthing. It is such a great design! Oh, I wish I had seen such an Hermès showcase, it is my dream. Glad you had the chance! We share not only our love for perfumes but also for Hermès–And guess what… the only design that I have in two different Cw it’s… De la mer au ciel!!!! One in warm colours( marron/viex rose/ bleu) and the other one in colder tones bleu jean /ciel/corail!!! What beautiful objects to own and wear..As far as I know, no one else makes such fantastic scarves. I have a large collection, but nothing with the beauty of these. A new obsession is about to bloom..Thanks for sharing them with us. 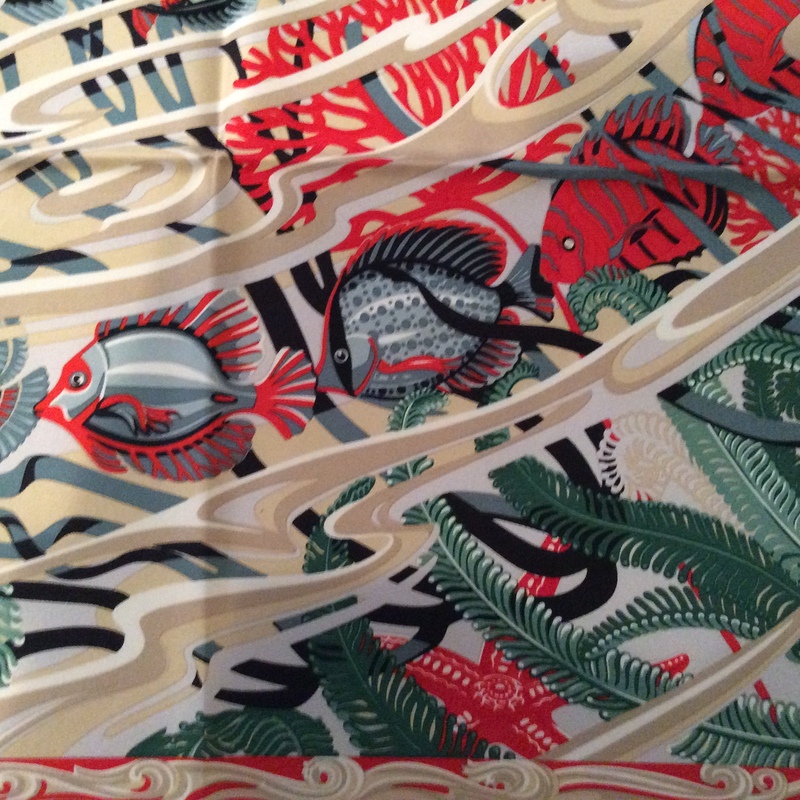 I agree, when it comes to scarves Hermès is second to none. So happy you enjoy reading these posts, Anita. (I get a lot of “hate” comments on them too that I delete, apparently Hermès – or luxury in general – creates very controversial opinions). Birgit, “Hate” comments show up on many forums. It’s not only luxury that brings out the worst in people; there is just an abundance of negativity and cruelty out there in the world. I was accused last week of having a “spy” FB page that was set up to foster a particular writer’s take on the Kennedy assassination. So, there is delusion as well as the other personality disorders that come into view. Ignoring and deleting is the best approach. Then clean your mind of all the ugliness and not let it bother your lovely self..Best regards, Anita. But you are right, delete and forget is the best way to deal with them. Oh, I love the cream, green and coral red version! I like looking at it flat the best, it’s so pretty, but I also like it folded on the diagonal that you show in the second of those two pictures, where there is not a lot of the design showing but a lot of the cream color with a bit of red. I imagine that the cream scarf would suit you perfectly, Suz. Why oh why did I pass this one up? What was I thinking? Beautiful scarves dear Birgit. I love reading about them and seeing how you tie them. These designs are both so detailed, I could look at them for hours! I especially like the challenge of having to go and ‘actively look’ for the fish and plants – it adds to the sense of mystique / intrigue. I think they are each beautiful in their way, but I would probably find the darker one more useful in my wardrobe. I am finding the different folding techniques particularly interesting – I bet you’d be a whizz at origami too! Beautiful scarves, both of them, but it’s the black and blue one that I can’t stop looking at. The scarf reminds me of the novels by Gabriel García Márquez: It’s what I imagine magical realism looks like.😍 Thank you for sharing them! The first one. Even though i always stay away from dark colors when choosing an Hermes, this carre is really elegant and sophisticated. That is the one I wear more often, it goes with everything. 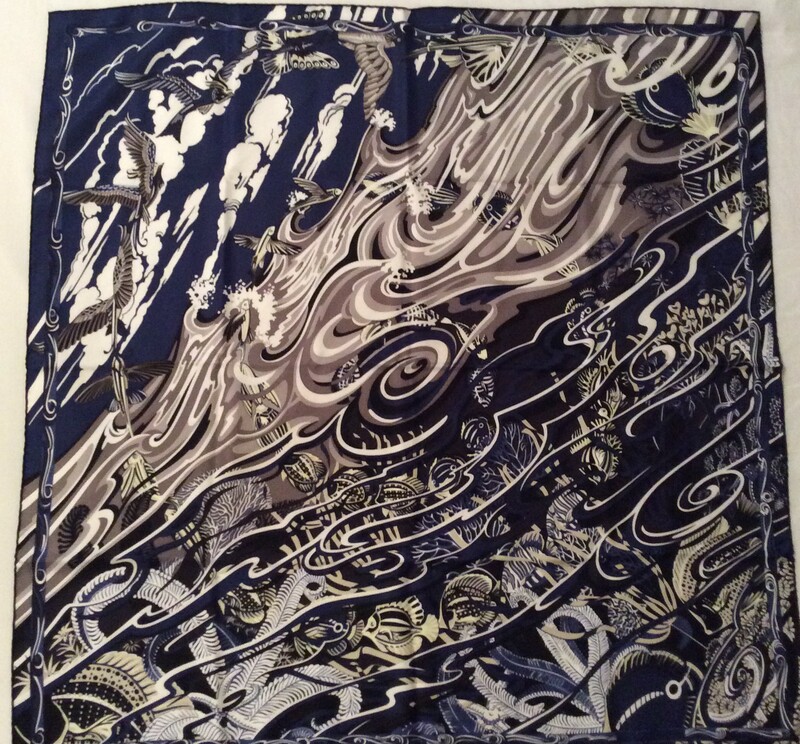 I’ve never been much of a scarf person, but these scarves are so lovely and intriguing that I can’t resist! Thanks for sharing them… especially the black/grey/pale yellow colourway of Minuit au Faubourg (that would be first on my list). Like marjo56 said, they embody magical realism. 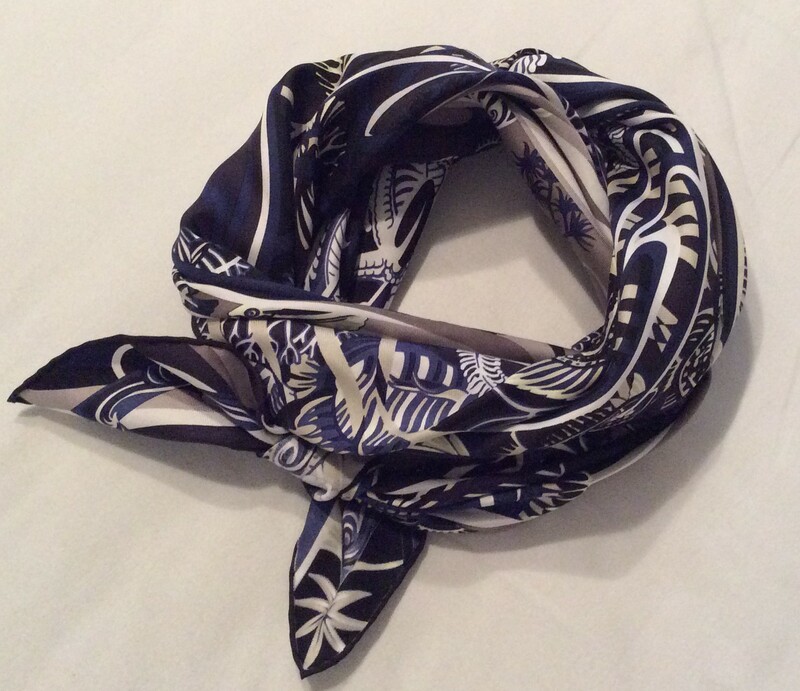 so lovely to hear that you are enjoying the Hermès scarf posts. Did I ever tell you that my Mum wore scarves? I’m pretty sure we’ve had this conversation, not a collector but she had maybe a dozen. She didn’t have Hermes but a few other designers and all of them bought when she was younger so they were excellent 50s & 60s and a very few from the 70s & 80s. I could totally imagine her owning the colourful version of this scarf. It’s brought on a lovely rush of nostalgia for her. That is lovely to hear, Portia. Your mom must have been such a wonderful lady. I love the way you talk about her. How beautiful both scarves are. True works of art, and proof of the usefulness of art in our lives. I find myself becoming obsessed with another version of De La Mer au Ciel, the grey and pale blue colorway. It makes me think of a cooling dip in an ocean teeming with life . . . thank you for sharing your treasures! These are very beautiful. I like big scarves but I’m not sure I could afford a really big Hermes scarf. Something to save for, though! These ones are perfect for you Birgit since you are a lovely slim person. I’m a bigger gal so I have to “go big or go home” with scarves-lol. I like the Eileen Fisher scarves- reasonably priced and kind of an older lady ‘boho” look. 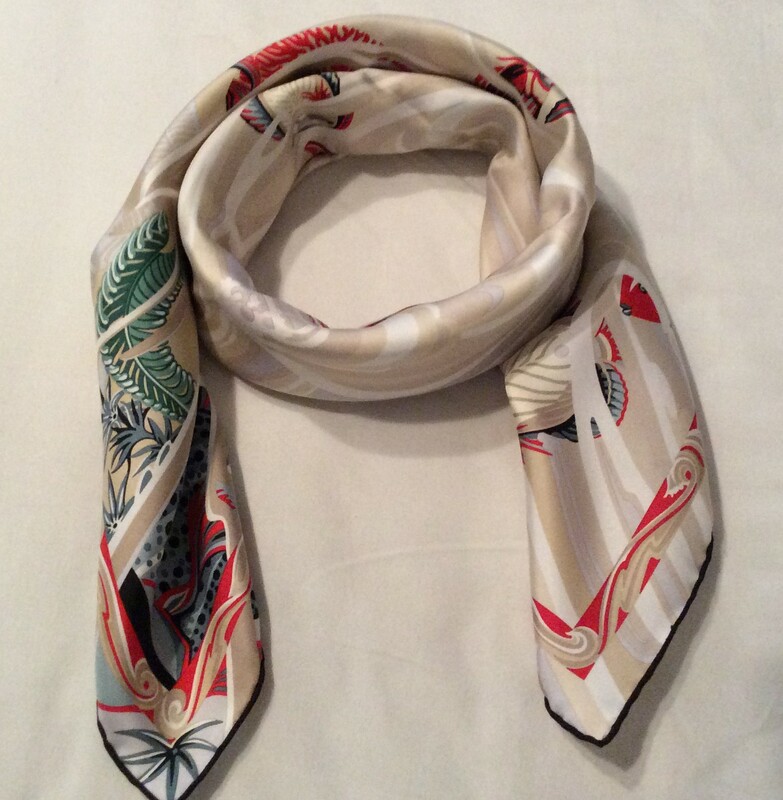 Keep the pictures coming- I’m enjoying seeing these beautiful scarves!! I do love bigger sizes as well, where you can wrap yourself in the material, and I agree that the big ones are very expensive at Hermès (which has not entirely stopped me though ;), there are a few big ones coming in posts further down the line). Oh, goody! I’ll stay tuned. I see some beautiful ones on Ebay listed sometimes by a lady who is a personal shopper in Paris. They are gorgeous. When I see one that is really “me” I’m sure I will succumb. I love the vibrancy of the colors. I didn’t get this one at the time, though I was tempted, the pattern is lovely! I would prefer the darker one, to wear anyway. They will bring the design back eventually, since it was a very successful one I believe. So you might get another chance to think about it in the future. Get thee away temptress! 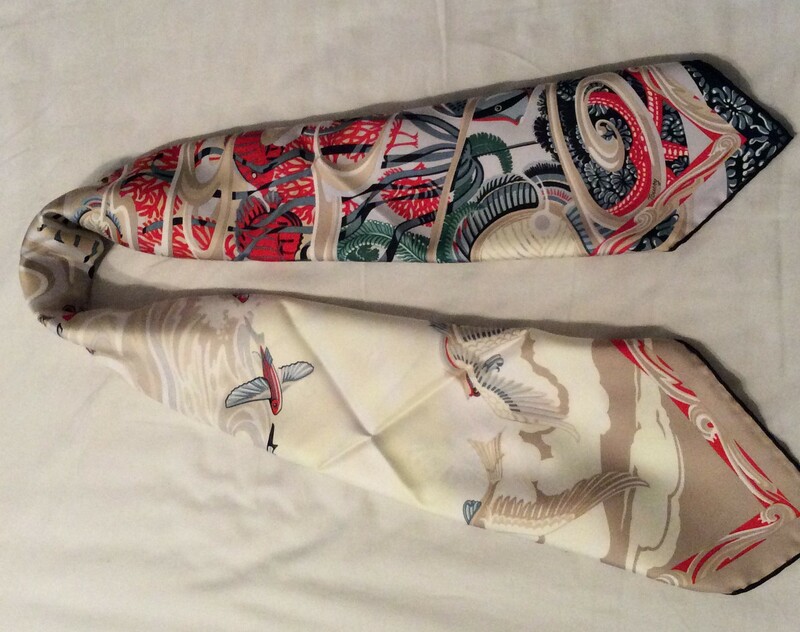 Love your Hermes scarf series always but it does rather make one want one. Love the dark blue best – it would go with anything, blue-jeans or a little black dress. I can imagine you look very beautiful with both Birgit. Enjoy. Whenever I see vibrant and colourful scarves that I can’t pull off, I think of you and how perfectly they would suit you. I love this design 🙂 Waves are so evocative, and I like how the fish “pop” in the lighter colorway. 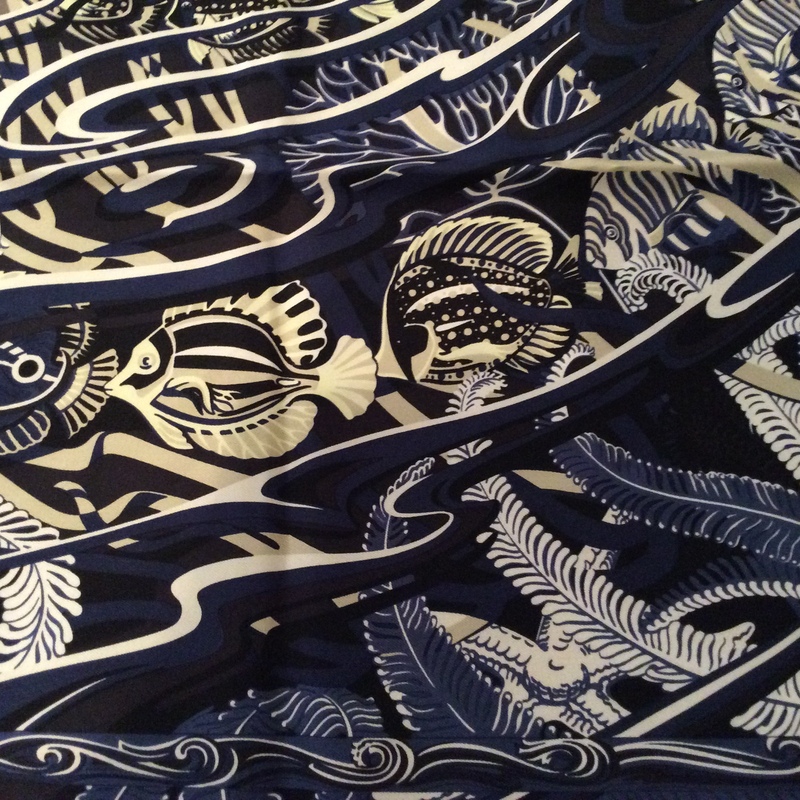 It is also kind of fun how the fish look like they are sneaking about in the lovely darker blue and black scarf as well! Clearly one would need both. They have such different character. It’s bad enough I have an addiction to so many Hermes perfumes, reading this I’m longing for a scarf or two. I doubt I would ever wear them though, so best not to be tempted. They really are works of art! While I like them both, the navy one really speaks to me. I love it’s dark murkiness and that fact that you really need to hunt to find the images within it. Of to H.com to do some late night browsing.